Some day we, too, will have to face the effects of a long life. What choice will you make as to how you handle the later years of your life’s journey? The shaking hands you find when watching the aged accomplishing the simplest tasks are showing you the hands of a person who has lived life. Have you ever thought much about what that actually means? How do you age gracefully? What is graceful about bent shoulders, wobbly knees, shaking hands, stumbling feet, a quivering voice, falling backwards, memory lapses or those dreaded wrinkles? Well, let’s analyze these, why don’t we. When I look at the bent shoulders and wobbly knees of the elderly, I see years of working, staying on task, to raise and support a family, striving to give them a little more than just their basic needs. There, you will find the old America, a nation of people who would never consider accepting charity, much less asking for it. They knew the value of work and the joys and pride found in the results of that effort. The shaking hands you find when watching the aged accomplishing the simplest tasks are showing you the hands of a person who has lived life. Those hands have held a plow or made a deal on a handshake or caressed their wife and gently held their newborn son. Those hands have waved hello to their cherished friends and said goodbye to those who have gone on before them. They have cooked and cleaned for their family, changed diapers, wiped tears, pealed potatoes, clean the home, made the beds, and washed the clothes of those they love. Those hands may have played the piano in pleasure or just been there to hold a friend in sorrow. With promise of heart's devotion. And arms to be my home. My silent dream come true. Is being loved by you. Stumbling feet and backward falls remind us that we came into this world helpless to take care of ourselves, totally dependent on our parent’s hands. And it shows us that we leave this world in the same way, if we are lucky enough to have a long and fruitful life. We will then find ourselves dependent on the hands of the children we have loved and nurtured into the adults they have become. It tells us of life as it runs in circles and those stumbling feet have come full circle. When we hear the crackling sound of a quivering voice, we hear the sound of a voice tired from many years of expressing needs, giving instruction, singing songs, laughter, sobs, and telling those close to them of their love for them. Also, with that voice, if you listen, you will hear the stories of their life and the lessons learned there. At their feet, you can obtain a wealth of information, as you listen to that crackling voice reminisce of family, lost loves, raising children, suffering, joy, the pleasure obtained in hard work, government, finances and the economy, past wars and lessons learned through them, religion, and their walk with the Lord. Their accomplishments can direct you to the path of yours. This and more is given freely for the price of spending a little time with them. We all joke about the memory lapses of the elderly. I choose to call them “Intellectual Interruptions.” But there are many other names given to the age old condition. I have heard comments such as, “By the time you're eighty years old, you have learned everything. You only have to remember it.” Or “Everyone has a photographic memory. Some just don’t have film.” In this age of computer memory, so many rely on a machine to keep up with their lives. However, though a computer has excellent memory, it doesn’t have imagination or emotion and they walk hand in hand with our memories to bring them to life. Of life in stride, with naught to hide. But clung, in peace, God's own release. With faithful stand, God's promised land. And what about those wrinkles! So many causes are given for those. Oh, they smoked too long, drank too much, too much sun, or too many worries, are just a few. Well, do you know one of the major causes of wrinkles? Smiling causes wrinkles but wouldn’t the world be a terrible place if no one smiled? So, be proud of your wrinkles of happiness…both yours and the happiness you spread to others through that smile. I choose to tell stories that make others laugh about it. Many times, I have told of walking through the mall with my beautiful daughters, having a great afternoon, forgetting that I am so much older than the girls. And suddenly, I see my mother’s reflection in a store window!! However, my mother is not with us. Have you ever had that happen, to have the realization of becoming your mother or your father just jump out and slap you in the face in the middle of an otherwise great day? It’s a real eye opener, for sure! Life is what it is and it is up to you to make it return to you, joy, despite the effects of it. So, remember, life is a gift and it is short lived. But it isn’t the end of you…simply an interval to what lies ahead. Live it well, with a song in your heart and the Lord by your side. And then, as the journey ends, you will be proud of the memories you leave behind for your loved ones and Heaven will be a sweet victory to which to look forward. And with a smile, she said: “Remember the five simple rules to be happy: 1. Free your heart from hatred. 2. Free your mind from worries. 3. Live simply. 4. Give more. 5. Expect less. As lost sheep, or a flightless dove. Found within the gates of Heaven. Giving us no merit or say. To reach the journey’s end we seek. As time is late upon this earth. Of this man who gave rebirth. We have offended Christ, our Lord. God’s plan for every man. How many know what this is? How many of you can even pronounce it? I can't. 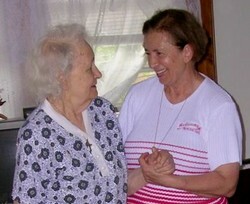 And yet, I have lost my dear friend, Elsie Harris, to this disease that seemed to come out of no where. Until Elsie's diagnosis, I had never heard of it or it's deadly affects and she would be the first to tell me to alert the public of this rare disease. My grandmother, Mary Grace Martin Ledbetter, born September 11, 1896, lived with our family until her death in June of 1965, when I was fourteen years old. The following is based on my personal opinions, memories, and the times shared with my grandmother, when I was a child, growing up in Pendleton, South Carolina. I felt her loss for many years after her death and will always cherish the time we were together and the things I discovered about life from having known her. There is so much to be learned from those who are older and wiser than ourselves. They have traveled the road ahead of us, know the joys, the pitfalls, and the lessons we must learn. They are our roadmap to our tomorrows, if we take the time to view life through their eyes. Do her memories begin with the first day she gently held your hand? Maybe its the day you sat alone or took your very first step? There was your first tooth and the funny face you made when first tasting something sour. Could it be that first birthday, as she realized just how quickly a year could go by? Watching you walk out the door on your first day of school, I am sure, brought tears to her eyes. The next time you pass an old farm house with its blackened boards and paneless windows, stop for just a moment. Take time to reminisce about the people who once may have lived there. Consider the stories they could tell you of the memories filling each room and the history that still resides within its walls. Feel the peace that can engulf you as you stand quietly, caught up in the past as it mingles itself into the present. Listen to the quiet sounds around you and remember a slower time when a butterfly could still light upon you, bringing with it the joy of your own childhood. This is such a beautiful article! Yes, it does but I am running as fast as I can! :) Thank you, I am glad you enjoyed the article. I agree...we have much to learn from those who have gone before us. A beautiful article written with real care. We need to respect our elderly and also make the most of our time as old age catches up with people very quickly. So true. We all are going to become old, at that point we need to be content and take aging as it comes. May be greeting the old age like an old friend. A very beautiful article as well as beautiful poetry. I take care of my 90 year old mother. Thank you, Terri...we should value our seniors...they are a wealth of knowledge, understanding and love! What a really touching article. I work in a nursing home and you hit the nail on the head about the elderly. Life does come full circle. God Bless you for a wonderful article.